Football player, hurdler, Olympic athlete, physician. William Donald Larochelle was born in Windsor in 1926 and attended school there. He enjoyed playing many sports, including track and field and boxing. He also played football and was named the All-City halfback while playing with the Assumption Purple Raiders. He continued his education at the University of Western Ontario and there he concentrated on hurdling. In 1948, he participated in the 1948 Olympics in London, England. There he ran the 400 metre hurdles and the 4×4 relay. 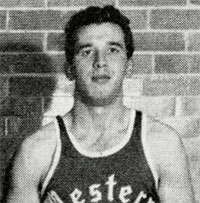 After the 1948 Olympics, Larochelle studied at the University of Western Ontario. In 1949, LaRochelle enrolled at the University of Ottawa. While in Ottawa, he played for the Ottawa Rough Riders. Because he was playing as a professional football player, he was almost disqualified for the British Empire Games. But in 1950, he was picked to be on the Canadian team for the British Empire Games and traveled with the team to Auckland, New Zealand. When his studies in Ottawa were completed, he moved to Manitoba and played with the Winnipeg Blue Bombers. After leaving professional football, Larochelle studied at the University of Manitoba and received his degree in medicine. William then set up his first medical practice in Stanley, North Dakota. Later, he moved to San Mateo,California and opened his own medical practice there. After his retirement, he moved to San Carlos and died there in 2011. Techko, Tony, and Carl Morgan. The Olympians among Us: Celebrating a Century of Excellence. Tecumseh, Ont. : TraveLife Pub. Enterprises, 1995.